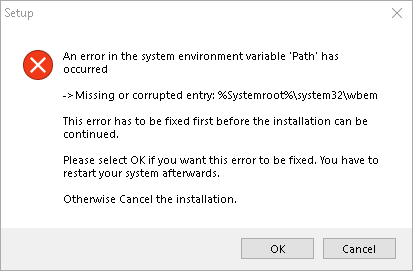 When installing (PDFCreator-3_3_2-Setup) on Windows 10 / 1709 (AV disabled) I receive the following error message. After restart we're able to install PDFCreator successfully. Has anyone encountered this error, is there a way we can bypass? This one is new to me. Could you send me the PDFCreator Setup log (C:\Program Files\PDFCreator) via direct message? I have about 100 clients I have to add this to, PDFCreator is required for SOLIDWORKS Electrical 2018 SP05... The installer kept failing to install PDFCreator, now that I've added the Environment Variable, everything is working fine.